Overeating is a roadblock to weight loss, but that’s not the hardest hurdle to overcome. Identifying your triggers are and you need to learn how to prevent them before they give you an impulsive urge to binge-eat. Not sure what your triggers are? Follow these steps to figure them out. Step #1: Know the most common triggers. Step #2: Consider what triggers you think you might have. If they are non-applicable, it’s time to dig a little deeper. Sit down with a pencil and piece of paper, and brainstorm a list of potential triggers you might have. Think about these questions: When was the last time you overate? What happened right before that episode? What did you feel or what was going on in your life at that time? Sometimes the people closest to you, like your parents, siblings, spouse, and friends, know you better than yourself. If you still can’t figure out what your triggers are, ask them. Write down what they say, and don’t be offended. This is stuff you can use to your benefit. Step #4: Start a journal. The purpose of this journal is NOT to stop you from eating, but to help track your dining habits. If you ate unhealthily the day before, don’t feel bad and start reprimanding yourself. Continue to keep the journal because it will be most helpful in finding out what your triggers are. Step #5: Revisit your journal. Possible Trigger #1 – Tiredness. Went to get drinks with friends even though I was tired, ate unhealthy foods. Possible Trigger #2 – Headache. Also had headache before overeating when out with friends. Possible Trigger #3 – Guilt. After feeling guilty for eating bad foods, I continued to eat unhealthily. Bonus Possible Good Trigger – When I was proud of my boss’ review, I made better choices. Step #6: Change what you can. If you noticed insufficient sleep is causing you to eat more the next day, get more shuteye. If you realized that feelings of rage and anger results in your shoveling food into your mouth, learn how to channel that energy into doing something positive. 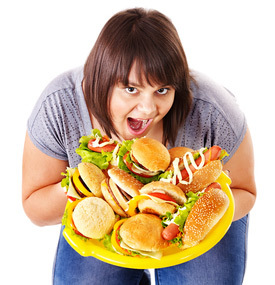 Is stress causing you to overeat and gain weight? Figure out how to destress and control your cravings. Conquering overeating might seem impossible, but by making a conscious effort, you can prevent the triggers from controlling your body, health, and life. Good luck!